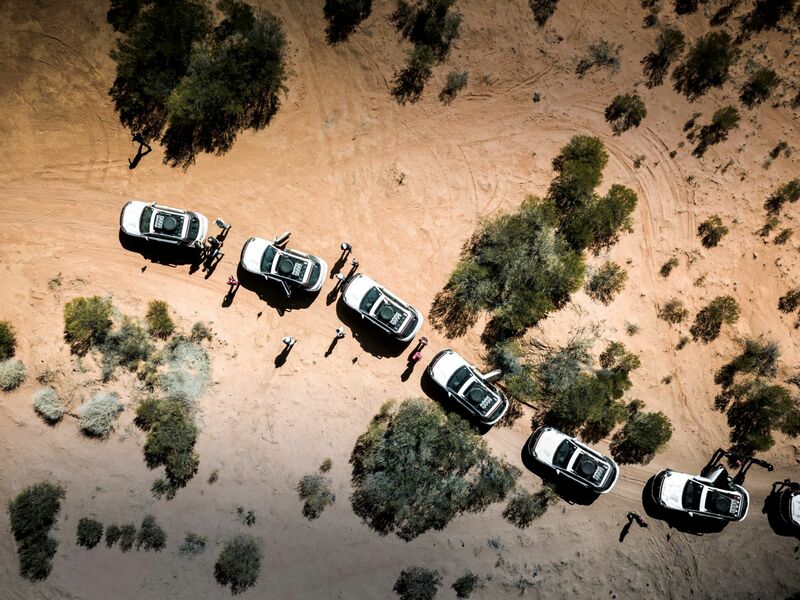 That was how international automotive and travel photographer Kim Tonning found out about—and eventually joined—the Porsche World Expedition (PWE) from Jan Kalmar, expedition leader and long-distance driving world record holder. Over the next two years, Kalmar would do a series of these awkwardly abrupt conversations with a small team of carefully selected people he had worked with over the years as a race-car driver and driving instructor, until he was finally able to put together a SWAT team of exceptional men and women who were just as crazy and passionate about creating something that would happen for the first and last time. The initial idea was born back in 2011, but it took over five years to convince Stuttgart (where Porsche has its headquarters) that he wasn’t stark raving mad. It’s one thing to hold the record for driving Cape to Cape—a 17,000 km trip from North Cape in Norway to Cape Agulhas in South Africa in eight days, 21 hours, and three minutes—but another thing entirely to create a similar type of experience that you can legally and morally drag customers to. Especially since Wi-Fi is now considered a basic human right. An expedition like that requires planning. A lot of it. Kalmar was given two years by Porsche to do so. We aren’t only talking about simply finding suitable roads, but creating bespoke ones just for these trips. Just like the 1,127 sand dunes which needed to be counted and eventually tackled while traversing the Simpson Desert, because there ain’t no app for that. Each one had to be guided by the hand of Kalmar. Each and every one. That means being out of the car, radio in hand, and talking each participant through. If that sounds impossible, just think: it needed to be done twice. There’s a reason that no other manufacturer has ever tried tackling this with their customers in stock vehicles. Maybe even legal reasons. Aside from requiring balls big enough to wrap a set of all-terrain tires around, it needed a small but resourceful team composed of a lead mechanic; a paramedic who can change tires and play the guitar during campfire; a guest liaison and press officer who could also double as the only source of information and link to the outside world when all communication except for a satellite phone were non-existent; and a support crew to monitor the real-time progress and situation from a climate-controlled room in Stuttgart. Only when Porsche was convinced it wouldn’t be putting any of its customers in considerable danger did it give the green light. Even then, it was still more of an amber one with intermittent flashing reds literally hours before the flag-off in Queensland, Australia. In fact, it wasn’t until the last car got flagged off from the Brisbane dealership did the PWE crew start to believe it was really happening. I joined up with the convoy somewhere in the middle of the earth, in a place called Uluru National Park in the Northern Territory of Outback Australia. To say this place is remote is to say Manila is congested. This is a place so isolated and quiet, it is where silence comes when it needs to think. Just to put that into perspective for a car guy, let’s just say that it took me almost 1,000 km to realise I was driving a left-hand drive vehicle in a righthand drive country, because without context, there’s really no way of telling. After enjoying cocktails at sunset by the world’s largest rock, the group was treated to dinner under the stars before being sent off with a full tank of gas, 80 litres of reserves in four jerry cans, two spare tires, one “Our Father,” a “Hail Mary,” a “Glory Be,” and an iPad that came preloaded with a custom-built map that was created just for this trip. Initially, I felt humbled by the grandeur of it all until I realised that, in a way, it was the last supper. They had to be as nice as possible. Because while it may have all been recon’d by Kalmar’s team, this was still the great outdoors at its most open. Anything could happen. Preparing for a road trip like this conjures up feelings you may never know you had before. While I had been on hundreds of international media drives before, each one of them completely awesome, being out here, where the variables could not be controlled by corporate, it heightens all the senses. The convoy rustled to life around 7am, although the crew had been up much, much earlier. They had to vulcanise every spare tire they had after bursting 11 tires in 10 minutes due to a particularly harsh patch of gravel and sand the day before. How these cars remained screwed together after that brutal jaunt across the desert remains up there with whatever happened to Amelia Earhart. The Drive to Perth was separated by about 1500kms of red dirt roads punctuated by overpriced gasoline stations. Seriously. Plus, you need to pay US$20 per vehicle for them to unlock the padlock of the cage that surrounds it. Seriously. Fuel is precious out here. After almost a thousand kilometres of driving through practically nothing and craving a hot shower and a nice warm bed, we arrive at the campsite where I was presented with my tent. A simple, basic tent. Not the glamping type, but the type you see on sale at your friendly neighbourhood hypermarket. Ironically, as basic as it was, it was the most amazing accommodation we had. At the end of the day, anyone can stay in a five-star hotel; but this here was a bajillion-star one as the lack of any light pollution cleared the canvas for the most amazing stargazing you’ll see outside of the Oscars. Two days and many hard-to-pronounce towns later, we reached City Beach in Perth, which is where the first leg officially culminated. I had spent my teen years and early adult life here, so I was met by my in-laws who, of course, were eager to hear all the stories about what I had seen in the Outback. Which got me thinking. While I was wearing a grin wider than the front grille of the Cayenne I was driving, if I were completely honest about it, looking back there really was nothing much to see. There was of course Uluru Rock at the start, as well as the exhilarating sight of a pack of V6 Cayennes tearing through the landscape, but the rest was seemingly an endless supply of desert and sky that tended to meet halfway on the horizon. So, I paused for a bit while I tried to attach the feeling I had to something tangible, like a view or something I could offer as a receipt. Until I realised that I couldn’t quantify the experience by what I saw. On the contrary, it was that vastness of nothing that made it really something. Because it provides perspective. It reminds you of your place in the universe. It’s God’s way of hitting the mute button, which forces you to listen inward and allows that inner voice that has slowly been drowned out by all that adulting, to start speaking to you like an inquisitive child again. And if you listen close enough, it will eventually ask you: when was the last time you did something for the first time?